The 2014 Toyota Tundra is the only truck manufacturer to have adopted the SAE’s towing standards. What are the big boys trying to hide? Many people don’t realize that with 250,000 trucks sold annually, Toyota is arguably the second or third largest light truck manufacturer in America. In combination, its Tacoma and Tundra rival any single brand except Ford when it comes to all but heavy duty truck sales. Given that leadership in the industry, maybe it isn’t so surprising then that Toyota’s trucks and SUVs are the only ones to have adopted the Society of Automotive Engineer’s (SAE) towing standard known as J2807. The SAE towing standard has been in place for about 5 years and it details comprehensive standards for engine, transmission, cooling, axles, structural capability and more to ensure repeatable towing safety results. It was developed in partnership with the major manufacturers and it provides for standardized testing and ratings systems for all vehicles that tow. Watch any truck commercial and you will always see the big boy trucks slogging through a work-site pulling an enormous trailer loaded with logs or stone. Ford’s F-150, Chevy’s Silverado, GMC’s Sierra, and the Ram truck commercials like to brag about their capabilities, but they set their own standards, rather than adopt the automotive industry’s engineering group’s set of standard tests. What are they afraid of? The largest trucks, known as heavy-duty pickup trucks, can all tow insane loads. That is not really in question. However, many homeowners that use their truck or SUV to tow a boat, snowmobile trailer, or camping trailer have legitimate questions about the ability of a half-ton, full size pickup truck to safely move what they need to. 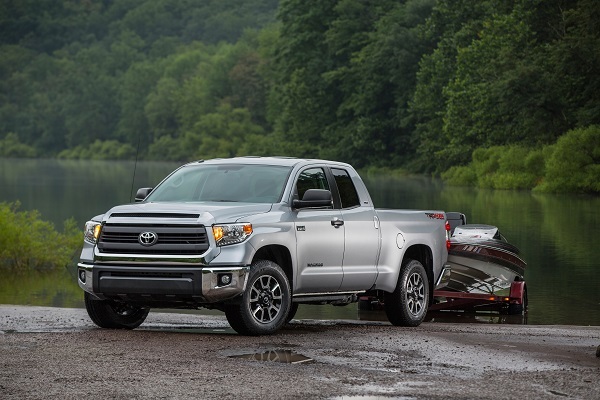 If they choose a 2014 Toyota Tundra they know that the towing rating is set by the automotive industry’s engineering group, rather than by the individual automaker. Commenting on Toyota’s leading the way in adoption of the standard Mike Sweers, chief engineer of the Toyota Tundra and Tacoma said “Toyota owners look to us to develop vehicles that meet the highest safety standards, and our voluntary adoption of J2807 helps us deliver on that promise. Tundra owners can tow confidently knowing that the published tow rating has been verified by the industry’s foremost engineering authority. With Tundra, what you see is what you get.” All Toyota trucks and SUVs that have a tow rating met the SAE standards. The Tundra has met the standard since 2011 and is the only full size pickup sold in America that does so. At the recent Texas Truck Rodeo, The Texas Auto Writers Association (TAWA) provided Toyota with its Distinguished Service Award for its leadership in adopting third-parting towing standards and certification. The TAWA group likes the Tundra for many reasons, but especially because, unlike many other trucks on the market, the Tundra is built exclusively in the United States by Texans. The SAE towing ratings are ignored by the Big 3 because they know that those ratings are no more valid than the EPA fuel economy tests and ratings. If Toyota had trucks that could pull the amount of weight that the Ram 1500, Ford F150 and Silverado 1500 could - they would be publishing those figures as well. Toyota only conforms to those standards for the sake of being able to say "we are the only company who conforms to SAE standards but the buying trends make it clear that consumers dont care about that. Good feedback. You're right about the trends. Trucks just seem to get bigger and bigger every year, Toyota's included. Thanks. I like the last statement in the story.....glad it is made here...but where does the money go? 95% back on foreign soil! John, You better get the fact checker out, Toyota is NOT even close to the big 3 in sales, even with the Taco added in, not even close. The Tundra has not been upgraded in any way in the last several years, other than this recent joke of a styling change and interior upgrade, the fact is, F150, Ram and GMC are all far better trucks than the Yoda. See below. I appreciate your comments. Tundra is even Toyotas number 1 selling truck. Really bad info you are presenting here. Check out the monthly and annual figures for yourself. See link and clarification below. Thanks for your comments. I don't know why you guys always hate on a Tundra. I am a man who owns a farm and owns all 5 major truck brands, Silverado, sierra, f150, ram, and Tundra yes you can guess I make good money. There both 2012 and Ive used them all about evenly and Ill tell you there trucks, make for work. They all done their job with no problem and i like them all...their all powerful and I love them. I love my F150s and Tundras better cause they get more of my job done. Both moral of my story is stop being biased truck buyers and maybe drive a different truck for once before you judge. I am a farmer. I have owned F150s, GMCs and (sad to say) 3 Dodge 150s and 2500 V10. I only owned the dodges because my ford dealer would not give me anything for trade. He really didn't even want them but to put them on his lot for publicity purposes. Didn't care for the GMC, but it was my dad's 1st. The F150 was great. I now own a 2012 Tundra and I won' have any other brand. You Dodge boys can brag those "DAMN RAMS" up all you want, but they are only pieces of "fertilizer", if you get the hint.